Quick little coment / Trick on Fusing. 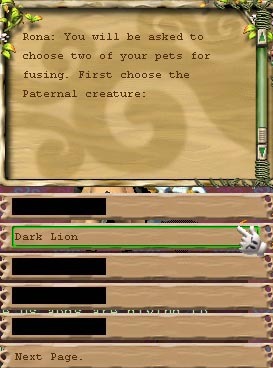 Cheap method for resetting a pet, get two pets of the same species and same level and Fuse them together for 5k instead of 100's of K.
|Pet1Status / 20| + |Pet2Status / 20| + 2. 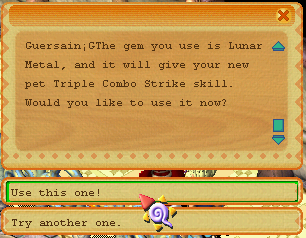 You will also require 5k coins to complete the Fusion. Next you will be required to choose how you do the Fusion. In this case "Pet Nutrient" you are choosing the upgradability. 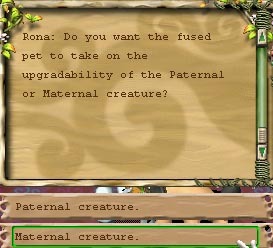 You are now given the option to choose the upgradability of the "Paternal" or "Maternal" pet. 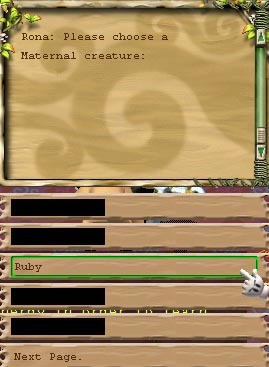 Considering we are doing a Str/Str Fusion based on the Fire Ruby, you can see the option you will have to choose is the "Maternal". Now you pray and hope Lady Luck is on your side. As you can see she wasn't with me this time. One more thing: If you see the fusing screen showing a Dark Lion on it, it doesn't mean it'll come out as a Dark Lion, it only means that the monster type is Lion. You are able to control everything using a Life Core. You also need 5k coins to complete the Fusion. 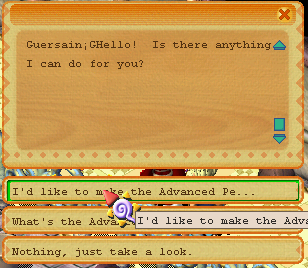 Next you are required to choose how your doing the Fusion. 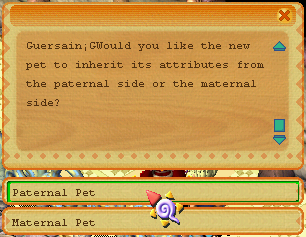 Your option is to choose which pet to infuse the "Attribute" from. The "Attribute" equals Element. 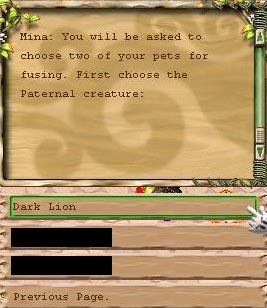 In this case we want the element to be Dark (Paternal:) Our dark lion. 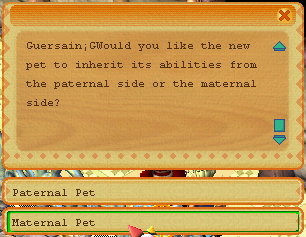 You are now given the option: too choose the upgradability of the "Paternal" or "Maternal" Considering we are doing a Str/Str fuse based on the Wild Cat (Fire Cat) and it's growth is Str/Str. 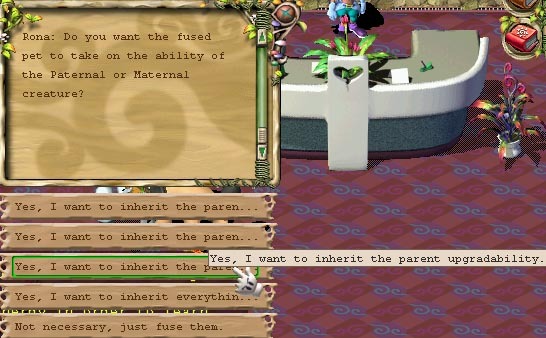 The option you will choose is the "Maternal". Now you Pray That you did everything properly. With a Life Core you have the option to fully control the desired species / element / and growth and if you do it properly you will recieve something similar to above. 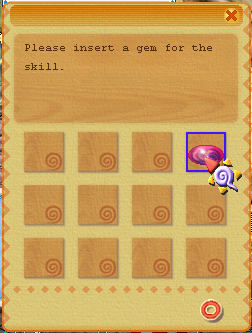 You are able to control everything about the pet > AND > add extra skills using Gems! 1. 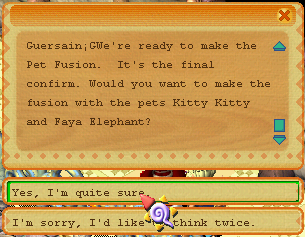 Tell Guersain you want to make an "Advanced Pet Fusion"
2.Choose "I'm ready for it"
13.And here is our result! 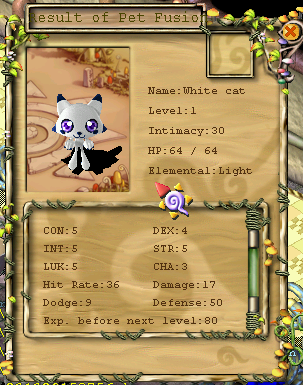 A light Kitty with Str/Str growth and triple combo skill inborn. Thanks for the screenshots stybex! People can fuse two pets into one, without using special objects. -This fuses both pets together and creates a level 1 pet. 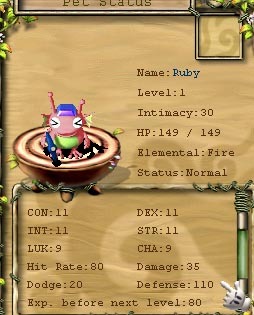 -The final pet can gain the stats, element and race of either of the two fused pets. -The outcome can also be a completely random race, but the chance of that is very very low. -The pet that can come out, depends on the level of the parents. For example: Cap 1 pet x Cap 1 pet = most likely Cap 1, but an estimated chance of 10% on a Cap 2 pet. Never will the outcome be higher then a Cap 2 pet. Cap 3 Pet x Cap 3 pet = Cap 1, or Cap 2, or Cap 3. No pets above Cap 3 (lvl 61) cannot come out in a regular fusion. 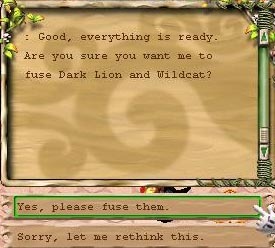 Fuse Only pets CAN come out of normal fusion, as long as the parents Wild standard level (not the trained level) combined and divided by 2 is higher then the fused pet's "wild level". Check Lager's guide for info on the levels. for example a Red Infantry (Level 46 fuse only) can be obtained when you fuse a Wooden Infantry (lvl 51) and a lvl 31 or higher fire pet of choice. 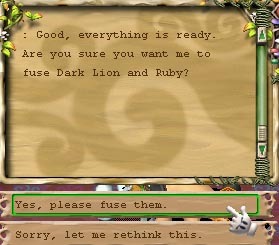 Note that Fuse-Only pets with an X cannot come out of standard fusion. 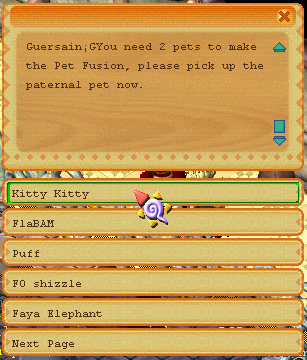 By using the right 2 pets for fusing, you can in a way steer the result a bit in the right direction. This, of course will mostly be of use when making a Cap 1 pet (because then the outcome options are smallest). 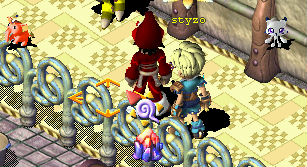 Talk to the NPC in the pet shop and you will fuse the two pets. You will have no control over the outcome. Possible outcomes: Wherewolf (Cap1), White cat (Cap1), or Light Wolf (Cap2). 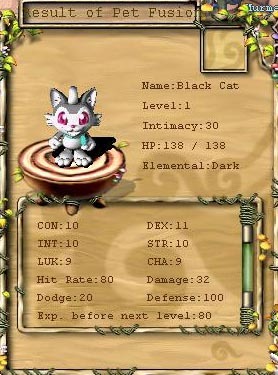 (Dark cat won't come out, it's level is too high (lvl 66 Fuse only pet). 50/50 chance for the desired pet. In addition to the two pets and 5000 coins you also need an element crystal to control the element in a pet fusion. You will need an Element Crystal that is the same as the element you are merging for. 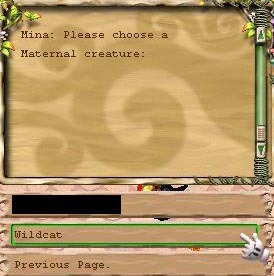 You need a Pet Card of the pet which you are using to control the element of your desired species. 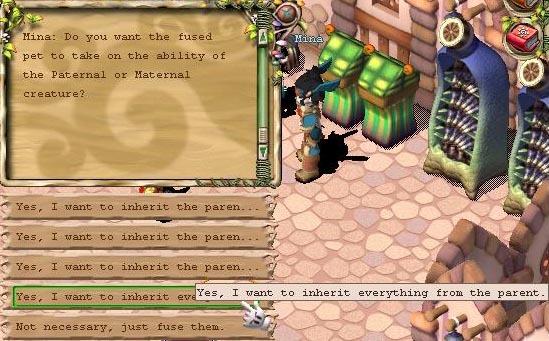 Use the following "rules / suggestions"
The species you want = Paternal. If you use 2 monsters in a fusion A+B with element crystal your monster species will be either A or B, but the element is guaranteed. following to control race in a pet Fusion. You need a Pet Doll of the pet whose race you are trying to fuse for. 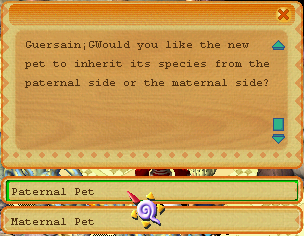 If you use 2 monsters in a Fusion a+b with pet model your outcome of element will be either a or b, but the species is guaranteed. and can be bought in Lager's Item Mall. Pet nutrient - different -purpose to inherent growth, pets found in wild over lvl 60 will not come out. 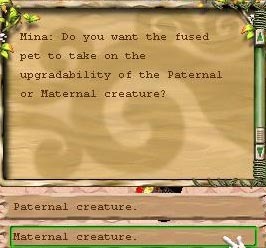 The pet you want to make : Paternal, the pet your fusing with Maternal. 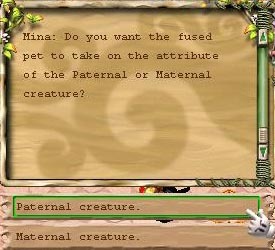 Next use a doll and card of the pet you are fusing into the paternal so you are using a doll and card of the maternal pet.